I’m not surprised it’s not often someone wants to part with one of these machines. I’m so irritated I barely missed a good opportunity not long ago. Would prefer travelling within the mid-lower Michigan area, but would go to Indiana/Ohio if meeting someone halfway would work. Might consider longer travel for a good deal. PM me with a price please and I’ll consider it. PayPal only. Thanks all! You check your Craigslist for Detroit? There’s one up for Supermax. You check your Craigslist for Detroit? There s one up for Supermax. If you can get a supermax drum sander they are excellent. If you want new checkout Johnson’s Workbench in Charlotte. I bought a supermax 16-32 from them in December. If you can get a supermax drum sander they are excellent. If you want new checkout Johnson s Workbench in Charlotte. I bought a supermax 16-32 from them in December. Sounds interesting. I love that place! Mind me asking what their pricing is? I paid the retail price of 1199. During the expo it was 999. I didn’t have the funds during the expo, I feel the savings on shipping made up for paying full price. Thanks for the suggestions folks! I did some more searching and rewearching and found a 30” Flatmaster for sale. I’m picking it up tomorrow. I’m thinking of finding a cheap power feeder for it. Anyone have something like that laying around they want to part with? I have a performax 16-32 for sale in St Petersburg, Fl for $325. I guess its’s a little bit of a drive from you. I have a performax 16-32 for sale in St Petersburg, Fl for $325. I guess its s a little bit of a drive from you. Oh man that’s the price I’ve been looking for! Wish it wasn’t a hassle to ship something this big. Anyway here’s what I got from a guy last night. Haven’t put it through the paces yet but I’m impressed so far! Is that a Flatmaster? I bought a kit and built a similar machine that works the same way from the same company. I now use the Jet 16-32 more but my kit version of this sander works very well. The problem with this configuration is you can’t control how much material is removed and from where very well. You can wind up with a board with sides that aren’t parallel with too many passes. Is that a Flatmaster? I bought a kit and built a similar machine that works the same way from the same company. I now use the Jet 16-32 more but my kit version of this sander works very well. The problem with this configuration is you can t control how much material is removed and from where very well. You can wind up with a board with sides that aren t parallel with too many passes. I was happy with my kit built until a guy advertised that he wanted to sell his almost new 16-32. I went over there and he was actually trying to raise the money to buy a jointer. 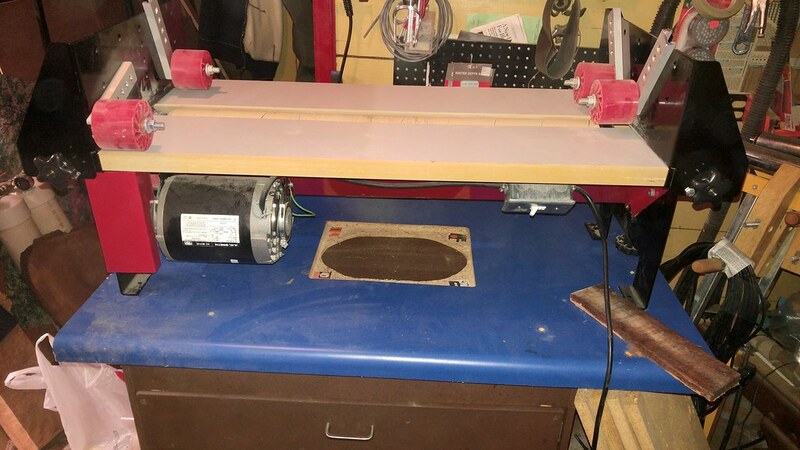 I had a very nice Ridgid 6” jointer that I had recently replaced with a Jet combo machine. We swapped and I felt like a bandit. Nice deal! Any pros/cons to each sander?